Hi Colleagues! 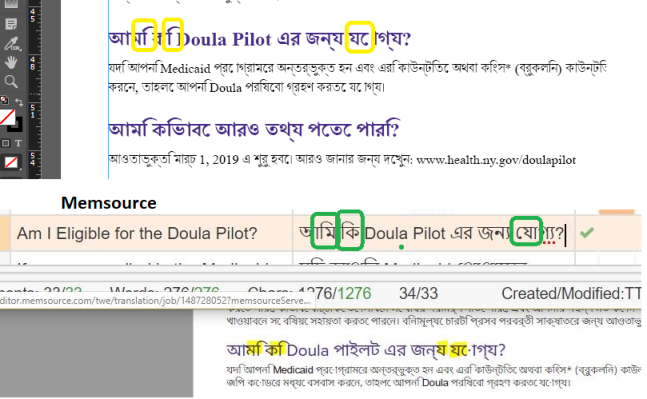 Managing a multilingual project with a source native file in InDesign (a short marketing brochure) I found trouble managing Bengali. The translation had been processed in Memsource, without previously adapting the font. Characters looked totally normal in the cloud (Web Editor) and when opening the MemXliff with the help of the desktop application. Nonetheless, the file showed corrupted with all characters messed up when opening the completed Bengali file in InDesign. No compatible font could be found that could show those characters sorted out and "linked" the right way. The weird thing was to copy and paste that same text in other word editors like Notepad or the Google Translate window. At that point, all characters got lined up correctly, and Google ended up throwing a good acceptable translation that resembled the English source. While checking with Memsource's Tech Support, let me paste a snippet of one paragraph as seen in the translation environment (the Memsource screenshot right in the middle) and how characters got misplaced either in InDesign (upper part of the image) or at the printed PDF coming out from that same InDesign. Encircled in green in the Memsource screen you will see the right alignment of those characters. Highlighted in yellow and encircled in red you will see how they get twisted. One way that I found useful was to try and copy the text from Memsource to another software. And doing that I found out that in the Office suite, and notepad the text remain the same, BUT! pasting it to Indesign the text got changed. Any DTPers that know why and how is this happening? 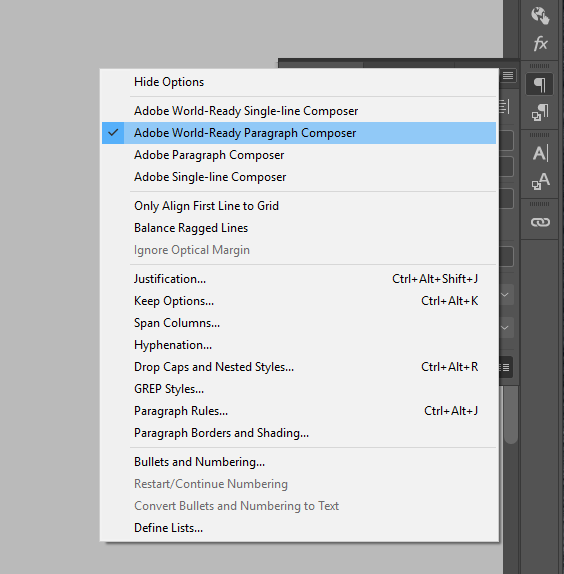 The first thing you need to do is to set the paragraph as Adobe World Ready Paragraph Composer. Thank you, santiagop! I assume this is under the paragraph menu. Please correct me if I'm wrong. You're right Gentle. You can get this option by clicking in the top right corner icon in the paragraph menu.